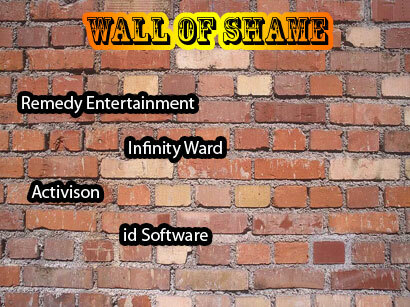 Like most candidates, id Software was long overdue for the Wall of Shame. Writing this breaks my PC gamers heart. id Software is the grand daddy of PC shooters, so, I've given them time to redeem themselves. However, even grandpa knew when its time to retire, before he jeopardized the line. Rage was to be id's saving grace. An opportunity to show they can still make revolutionary products. It was not. In fact, it was the final death kick for the company. Bugs upon release, I can live with and are today's norm. But with Rage, id Soft decided to remove the capability to set your own graphic setting, a PC must. That's like saying you can't use a mouse as your controller. Rage is a blatant console port that adds nothing to the post-apocalyptic shooter genera. Historically, id Software hasn't had a good game since Quake III. That was 1999. Carmack and Cliffy B may as well be brothers. They both pioneered PC shooters, now all they do is complain about the PC, "We do not see the PC as the leading platform for games". The lack of titles and quality from id Software indicates they are incredibly out of touch with the PC and gaming market as a whole. John Romero - best known for grandfathering the term "Deathmatch". Tom Hall - who left to make what many consider the best shooter ever: Deus Ex. Adrian Carmack - who is actually suing id Software for not giving him his share of revenue.